(Photo courtesy of Sophomore Christian Lee) The Lee family spent about 16 hours at the tournament on the first day and 12 hours each day for the remaining three days, allowing them to bond as a family as well as channel their skills. Senior Angela Lee and Sophomore Christian Lee tackled the 2013 International Federation of Associated Wrestling Styles (FILA) World Championships and the World Martial Arts Games held in Split, Croatia, from Aug. 15 to 18. Angela Lee won two world titles and Christian Lee won five, making him the FILA world champion. “It was just a really great experience being able to travel all the way to Croatia and compete at the worlds and it all paid off in the end because me and my sister, we’ve been training very hard for this and helps to see your hard work pay off in the end,” said Christian Lee. About 40 countries from around the world participated in the tournament, which included four different categories: amateur mixed martial arts (MMA), pankration, submission grappling and Brazilian jiu-jitsu. “It was a really good turnout in terms of the competition, very high-level competitors and it was a positive experience for the whole team and our family,” stated Ken Lee, Angela and Christian Lee’s father and coach. Although she put hours into training and preparation, Angela Lee was the only girl in her weight division, preventing her from competing. However, she participated in an exhibition match with another girl from Ukraine in a weight division above her own. “She was about 20 pounds heavier and this was my first match of the day that I competed (in) and as we were going, I tried to take her back for a trip and she landed on me,” said Angela Lee. Despite the weight gap, Angela Lee only lost by one point. After returning from Croatia, Angela Lee learned from a doctor that the fall caused an injury to her shoulder and a fracture to her collarbone, which she had hurt the previous year. She was awarded two world titles concerning MMA and pankration for attending and meeting the weight limit but does not consider them a victory. “I was obviously really upset with the loss but it’s healing quite nicely, so I should be back training in no time,” expressed Angela Lee. As for Christian Lee, 14 of the opponents he faced were defeated. His five world titles ranged from one in Brazilian jiu-jitsu, pankration, MMA and submission grappling in two weight categories, 63 and 69 kilograms (about 139 and 152 pounds). He competed in four divisions, fighting three to four times in each. “I was very happy (once I won my first division) but I realized I still had three more divisions to go,” stated Christian Lee, “I had to stay focused because there was a lot of fights.” Although Christian Lee suffered an injury to the foot, on the final day he was offered a super fight, which is a fight between two individuals not competing for a title. Angela and Christian Lee prepared for the tournament by training for about six hours a day and improving their diet as early as two months prior. “They trained extremely hard for this competition and we always believe the victories are won in the training,” stated Ken Lee. Angela Lee said, “We trained before school, in the morning. We do this boot camp class; it’s about an hour. After that, we go to school, we come back and we have a private jiu-jitsu class for an hour.” They also taught a children’s class and did weight training for five days a week as part of their routine. While in Croatia, the Lee family stayed at Hotel Consul and were able to visit local attractions as well, such as Diocletian’s Palace, built by a Roman empire at the turn of the fourth century C.E. “I’m always really grateful coming back from these trips because we get to see what kind of culture is over there. We get to meet a lot of different people from different places. It’s really nice,” said Angela Lee. 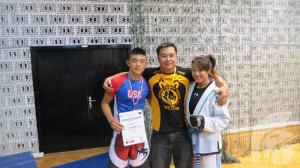 Christian and Angela Lee will continue to train for their next competition and hope to improve their abilities from this tournament and last year’s World Pankration Alima Championship.